One of my favorite things about the arrival of a new season is shopping for new beauty products that we are going to be turning to all season long, and beyond. Nail polishes are one of my weaknesses, so when I spotted these gorgeous Color Show Nail Lacquers from Maybelline at my local Harmon's store, I just couldn't leave them behind. They just scream fall! Audacious Asphalt is a lovely light grey creme. I don't have many grey nail colors in my collection-which is a shame because it makes for a great fall/winter neutral, so it's nice to add this one. This kind of grey hue is nice because it gives nails a clean and softened look, without being overwhelming. Twilight Rays is comprised of golden shimmer flakes which are embedded in a black creme base. I didn't think twice about picking this one up. Doesn't it look cool?! The flakes surely add an interesting touch, and I love how they don't drown in the black base. They definitely pop on the nails. I had no trouble with these when it came to the formula. These went on smoothly, and the colors flowed on the nails nicely. I like the nail brush on these because it really makes applying the color a breeze. In terms of coverage, the first coats do go on sheer, but the addition of a second or third is all it takes to get opaque color saturation. 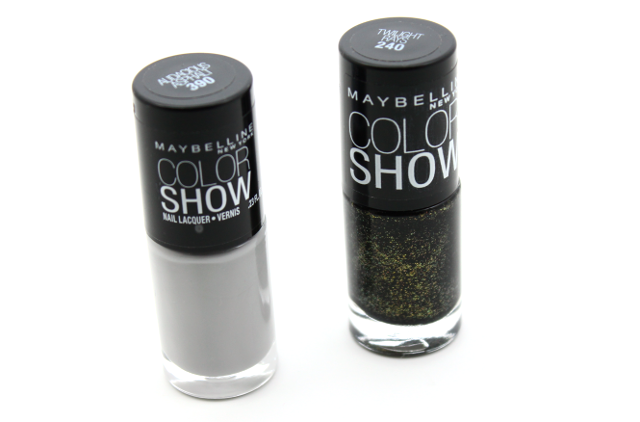 I am really pleased with my latest Maybelline Color Show Nail Color additions. I think Audacious Asphalt and Twilight Rays are amazing fall hues, that I know I am going to be reaching for quite often. By the way, Maybelline's Color Show Nail Lacquers are three free, so they don't contain Formaldehyde, DBP, or Toluene. Love it! I can't wait to pick up more of Maybelline's Color Show Nail Lacquers. There are so many variations of colors and finishes to choose from, and I love how inexpensive these are. Can't beat that! omg these look so gorgeous for winter time! !Love Colorama such a good quality for the price!